It’s not the first time that Imran Khan’s spokesperson is in the news for wrong reasons. Naeemul Haq, Pakistan Tehreek-e-Insaf’s notorious character, slapped a rival politician on live TV programme, but it’s certainly not something new. He has played the villain on numerous occasions, sometimes even disowned by the party’s media wing. From throwing glasses at the co-guests to being accused of asking female leaders for marriage, Haq never shows restraint. Hmari sari 6 din ki mehnat par aik tweet nay maa behen kr di. Level hai Sir Naeem ka. On May 22, 2018, Haq slapped Minister for Privatisation Daniyal Aziz on air during a live programme on Geo News. The privatisation minister apparently called Naeemul Haq ‘chor’ (thief) at which the latter could not keep his calm and spontaneously slapped the minister. In 2011, Naeemul Haq threw a glass of water at a Pakistan People’s Party (PPP) leader Jamil Soomro on air after which he left the studio during the live show. The two leaders exchanged abuses and Soomro even went to confront Haq. The matter was later resolved by the host and co-guest. In November 2016, video of a scuffle went viral featuring the leaders of PAT and PTI. Haq lost his cool and came to blows with PAT’s Khurram Nawaz Gandapur even though their parties were close allies. In August 2017, Haq admitted having ‘discussed’ marriage with ex-PTI leader Ayesha Gulalai on Twitter. The tweet, that was deleted hours later, said, “Should I apologise for discussing marriage with Ayesha Gulalai? No, I don’t think so. Nothing wrong with that.” The tweet came shortly after Ayesha Gulalai alleged she had received a text message from Naeemul Haque asking for her hand in marriage. Gulalai alleged then PTI spokesperson asked to marry her via text message. “I am alone and want to marry,” Haq said according to Gulalai’s allegation. Later on, PTI leader Shafqat Mehmood stated that Naeem’s account was hacked and the tweet regarding Ayesha Gulalai were ‘false’. In 2015, PTI’s founding member Akber S. Babar claimed that then party’s secretary information Haq used to send immoral text messages to the ex-wife of Imran Khan. 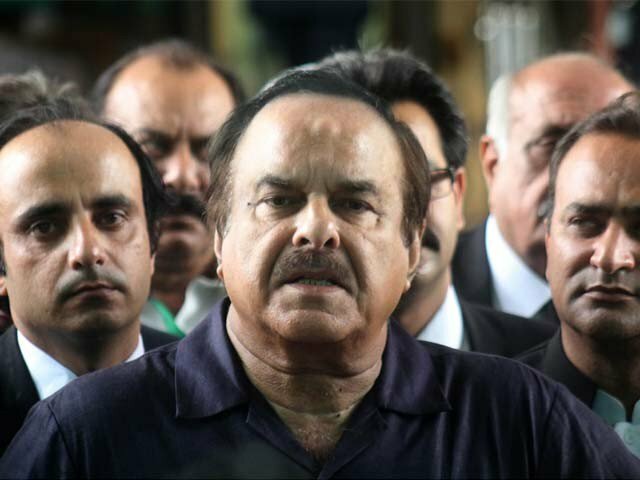 In a Facebook post, Babar said, “Although she [Reham], in all likelihood would deny it under the changed circumstances, but I can say it under oath that before she married Imran Khan, Reham Khan as an anchor of Aaj TV confided to me…about some obnoxious text messages from Naeemul Haq to her making unsavory demands on her in return for arranging an interview with Imran Khan. He further alleged Haq of harassing PTI’s women workers. “The most scandalous revelation is the repeated complaints by PTI women of alleged sexual harassment by Naeem ul Haq. In one purported email, Zahra Apa claims to have stopped PTI women from going public on Naeem ul Haq’s “persistent and most unwelcome and unsavoury harassment” of women.